What are the symptoms of mycobacteriosis in striped bass? Can I contract mycobacteriosis by handling striped bass? Can I contract mycobacteriosis by eating striped bass? What are the symptoms of mycobacteriosis in humans? What should I do if I suspect I might have been exposed to mycobacteriosis? Is fish mycobacteriosis related to Pfiesteria? How prevalent is mycobacteriosis among Chesapeake Bay stripers? Does mycobacteriosis affect other Chesapeake Bay fish species? How might mycobacteriosis be affecting the striped bass population in Chesapeake Bay? What is the history of mycobacteriosis in Chesapeake Bay? What is the focus of mycobacteriosis research at VIMS? How is mycobacteriosis diagnosed in striped bass? Mycobacteriosis is a generic term that describes diseases caused by a group of bacteria (simple single-celled organisms) known as mycobacteria. Mycobacteria are widespread in the natural world, particularly in aquatic environments. A small fraction of mycobacterial species cause disease in animals and humans. A newly described species of mycobacteria, Mycobacterium shottsii, is the type most commonly associated with the current outbreak of mycobacteriosis among striped bass in Chesapeake Bay. M. shottsii was first identified by VIMS scientists in 2001, and is present in 76% of infected bass. Some infected striped bass from the Bay are also known to harbor multiple mycobacterial species. Other mycobacteria recovered from Bay bass include M. peregrinum, M. marinum, and isolates resembling M. scrofulaceum, M. szulgai, M. interjectum, and M. simiae. The human health significance of M. shottsii is not yet known (see below). Concern is warranted because M. shottsii is closely related to M. marinum, a species responsible for mycobacterial infections of skin and soft tissue in humans. M. marinum is also considered the primary cause of mycobacteriosis in fish in aquarium, aquaculture, and natural settings. Other more distantly related species of mycobacteria include M. tuberculosis (the cause of pulmonary tuberculosis) and M. leprae (the cause of leprosy). There is a slight potential for human infection from handling striped bass infected with M. shottsii and other mycobacteria. Concern is warranted because M. shottsii is closely related to M. marinum, a species known to pass from infected fish to humans via handling. However, M. shottsii prefers growth at cooler temperatures than M. marinum. It seldom grows in laboratory cultures at 30°C (86°F), suggesting that it may not produce infections in humans. take particular care if they have a cut, scrape, or abrasion on their hands or arms, and wash thoroughly with soap and water after coming into contact with fish or open water. Individuals whose immune systems are weakened or compromised because of disease or immune suppression therapy should be especially careful to avoid wounds or abrasions. There is no evidence that humans can contract mycobacteriosis by consumption of cooked fish infected by M. marinum or M. shottsii. However, because of the risk of infection via handling (see above), any striped bass that exhibit external signs of mycobacteriosis (unsightly skin ulcers) should be released or disposed of. Do not keep or eat a fish that you would not buy in a fish market. It is not yet known whether Mycobacterium shottsii (the dominant species isolated in the current outbreak of striped bass mycobacteriosis in Chesapeake Bay) can infect humans. Concern is warranted because M. shottsii is closely related to M. marinum, a species known to cause disease in both humans and fish. 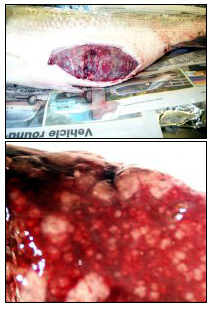 Primary symptoms of human infection by M. marinum include infections of the skin and soft tissues. Infection most typically becomes evident as reddish raised nodules on the hands, elbows, knees, and feet. In many instances the joints may become swollen. The occurrence of mycobacteriosis in striped bass (Morone saxatilis) from Chesapeake Bay was first noted by VIMS in 1997. Previous outbreaks of mycobacteriosis in wild striped bass have occurred in Pacific estuaries. Following the Chesapeake Bay outbreak, VIMS scientists isolated a new species of mycobacteria associated with skin and visceral lesions that they named Mycobacterium shottsii. This new species is closely related to M. marinum and M. ulcerans. To determine whether a striped bass is infected with mycobacteriosis, researchers must first remove tissue from a fish under sterile conditions. Tissue is typically taken from the spleen, as this is an organ that helps remove bacteria from the blood. The next step is to slice the tissue thinly enough so that a section can be viewed under a light microscope. Staining and other techniques help researchers determine whether any mycobacteria and/or characteristic lesions are present in the fish tissue. To identify the particular species of bacteria present, the researchers must isolate the bacterial cells from the fish tissue and grow them in pure culture on agar in petri dishes. Because Mycobacterium shottsii, the species predominantly isolated from striped bass with mycobacteriosis, is such a slow-growing organism, it takes at least 2 months to grow a sufficient number of these bacteria for positive identification.